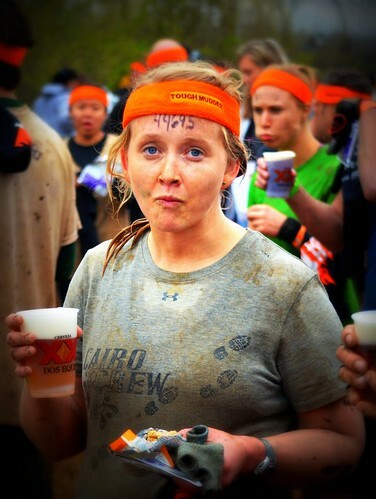 You are here: Home / All Recipes / WE ARE Tough Mudders…. 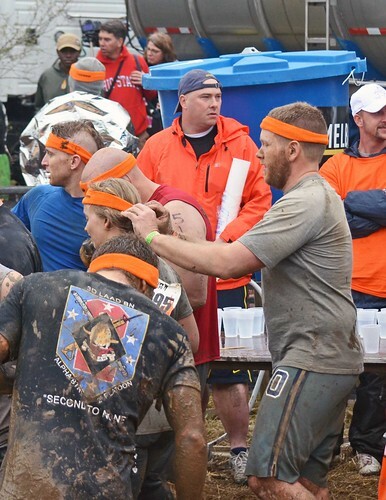 This past Saturday was not your ordinary Saturday. Not for Jeff (my older brother), Shawn (family friend), and I. 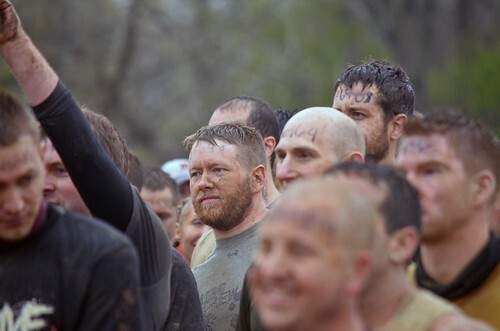 For us and about 13,000 others…it was Tough Mudder day. 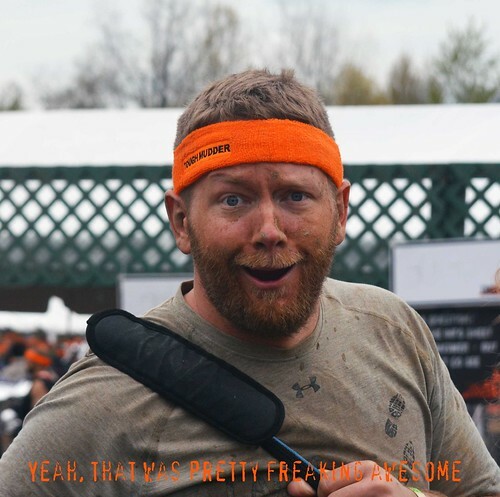 Beyond YouTube videos and a taste of extreme trail running from last year’s Mud Run …we hadn’t a clue of what was waiting for us beyond the Starting Line. We knew it was 13 miles. 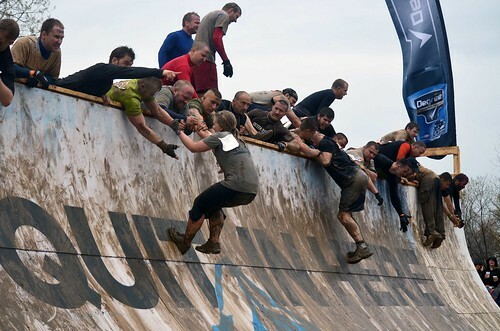 We knew there were 24 obstacles. We knew it was extreme. I am not sure we knew we would have so much fun! Or push ourselves so far. Or end up with so many bruises. Or run among so many fantastic people. Until then, I have these snap shots (thanks Andrea!) to remind me of how extreme you are. 10:40am Starting Time Line up…No turning back now. 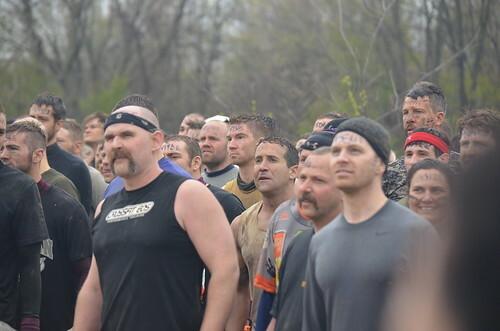 The challenge was held in a quarry in Amherst, Ohio (just west of Cleveland, Ohio). 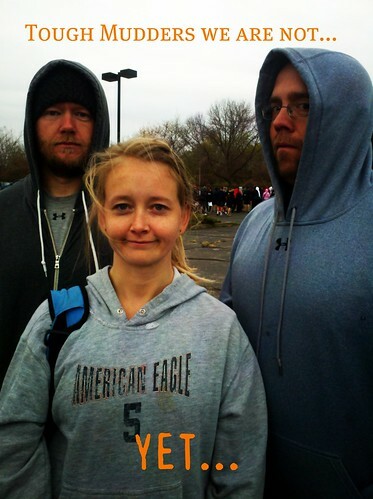 The air temperature was about 45°F. It rained off and on – not that we noticed. That is ice…if you didn’t know. 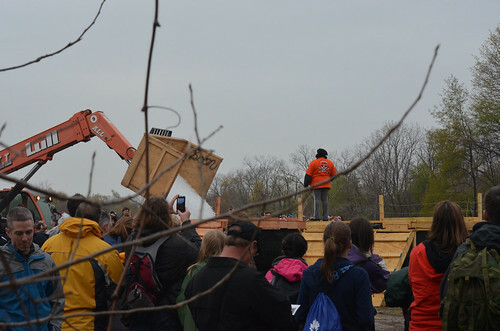 Dumped by the front end loader into large pits of already cold water…Like I said, Tough Mudder…not joking around. 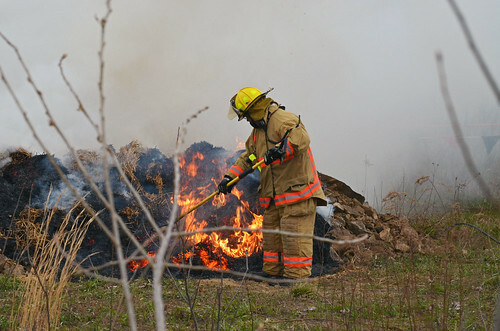 Elementary School fire safety came in hand here…stop and drop. I, however, remembered this after I had lungs and eyes full of smoke. which is cool, we like to swim through murky brown ice-cold water . 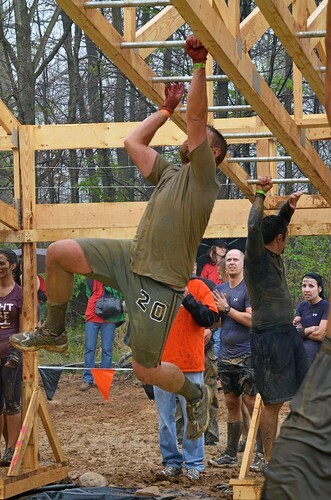 Who schooled the monkey bars…this guy! What are they staring at? What strategy are they thinking up? And for what? Freakishly, this is not what we are concentrating on…nah it’s the quarter pipe he is running up. 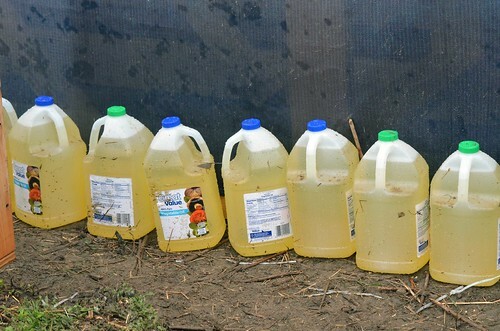 Wal-Mart generic brand vegetable oil. We all made it up and over the quarter pipe, each taking two tries. My trip over took a bit more effort, proof by the fingerprint bruises covering my arms – shoulder to wrist. I am starting upper body workouts tomorrow. Good leap…just missed the hands…and down I go. I got it this time…and after what seemed like an hour later (a few minutes at most), I got over the wall. 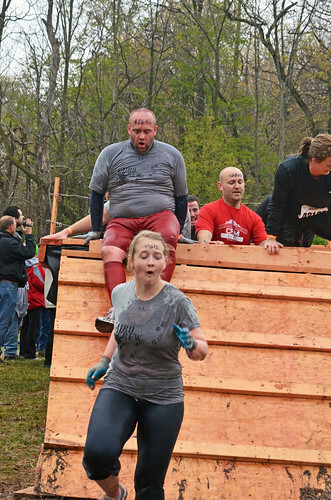 Thank goodness I have full editing power over this blog…there are some real unflattering pictures of this attempt. Let’s just say, when I was finally dragged over the edge…the 400+ people below clapped and cheered. God I love those people. 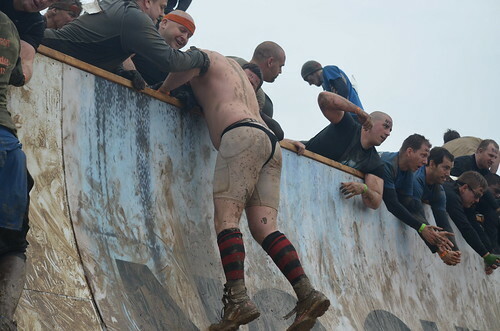 fyi…this obstacle was the 23rd obstacle. 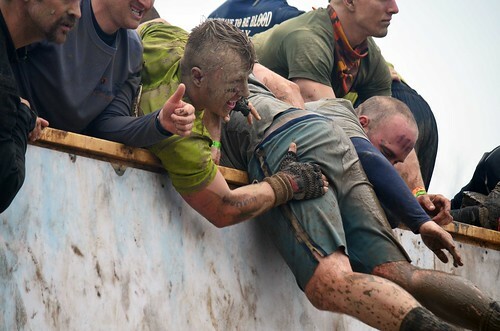 My arms were spent…but that is no excuse. Next year…I will need less help. Fact. 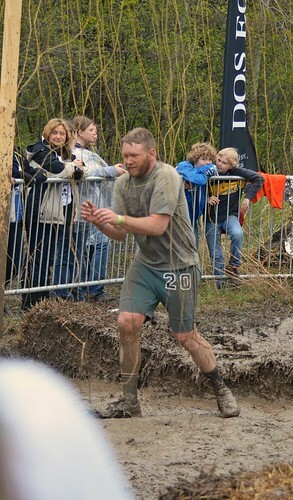 The final obstacle of the day was electroshock therapy…. 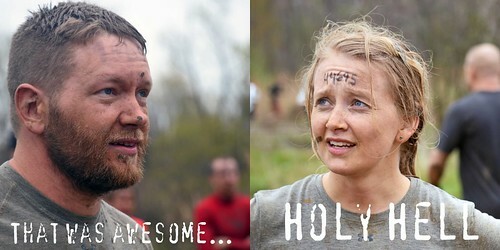 Jeff and I were shocked earlier in the day while army crawling through barbed wire. Not fun. 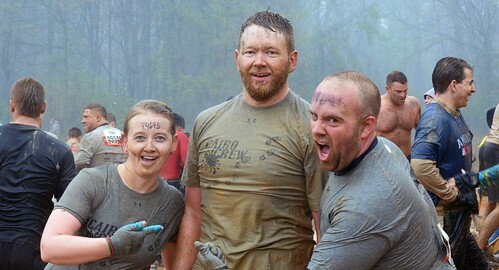 I cursed and ended up with my face in the mud. I don’t think Jeff had time to curse. Shawn got out shock free…lucky duck. But we got our headbands. No amount of photoshopping made this any more flattering…I tried. But I earned that look, fair and square. What was not included above was the 30 foot jump into the icy quarry, the miles of running through lose-your-shoe-sticky mud. Trenches of unknown depth and 15 foot walls. Or how about the hill climbs over loose gravel followed by wading through swamp land. I do not whine, kids whine. P.S…. 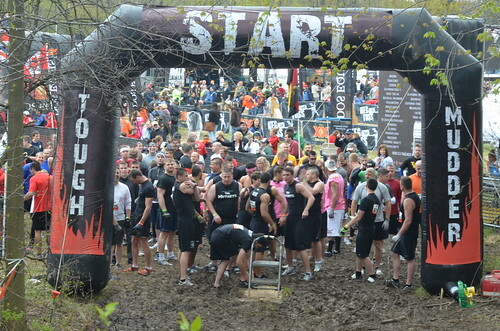 please do not compare this to a warrior dash or a mud run. 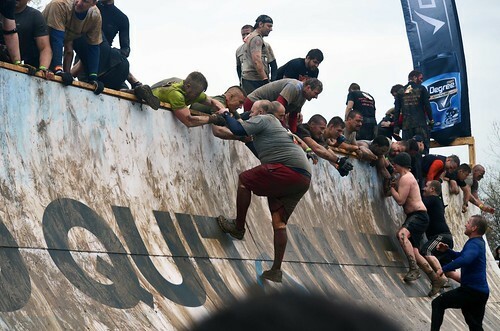 The Tough Mudder is NOT the same thing and we will take offense. Just sayin’.